Opponents of deployment of 5G wireless small cell towers in Montgomery County made an impressive showing at a public hearing on a Zoning Text Amendment on the matter last night before the County Council. Speakers opposing both the towers and the ZTA received repeated applause from the large crowd. 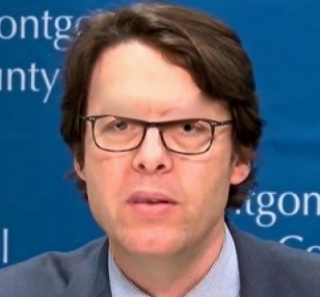 Council President Hans Riemer has tried to play both sides with Election Day fast approaching, but if the Council acts next month, he and others will be forced to take a position that could hurt them in November with motivated anti-5G voters. Concerns went beyond not just the dangers opponents cited 5G would pose to residents, but also the rushed process for the ZTA, that moved forward before all issues raised by citizens had been fully addressed by the Council. While the County is limited in what it can do to stop implementation of the towers, which the industry claims must be deployed to facilitate everything from better cell service to autonomous vehicles and smart appliances, some speakers urged the Council to use the leverage it does have in creative ways. Resident Edward Myers suggested requiring follow-up inspections for issues like radiation on towers constructed in residential areas. He noted that the current health-impact findings the industry and federal government are using as the standard are based on "1992 science." Resident Anita Prince cited more recent findings that, for example, show radiation impact on the human brain within three minutes of exposure. Supporters of the ZTA urged the Council to act quickly in approving implementation, so that County residents and businesses can be among the first to enjoy the benefits of the new technology. Some cited the potential boost to telecommuting, as more complex tasks could be completed by more workers from home with the more powerful system. Supporters at the hearing included residents and telecommunication companies.